The beast lives. Click here to play! I can feel it in my bones. The Crazy Crocodile of Carros Peninsula is out there and it's hungry. I've heard stories of it having eaten alive entire crews of shipwrecked boats here. I've also heard that it's half-pig, half-man and half-banana. There are lots of rumors about the Crazy Crocodile, but most of them lead back to one thing - it loves gold. I thank you kindly for funding this expedition to find the Crazy Crocodile in its natural habitat. We've looked for it in the 7 Islands region and the double BAR lakes nearby, but all evidence now points to the beast being in the Carros Peninsula. If we find it outside its home, then we'll simply have to follow it back to where the legends say it lives in a cavern lined with gold and jewels. Who knows if it's true or not, but either way that massive croc will be a sight to see! ...Oh. You just want the gold? Alright then, we'll do our best to find the gold! Play the Crazy Crocodile slots to hunt one of the most cunning predators in the world. Get 3 Crazy Crocodiles and you could win yourself a small fortune. 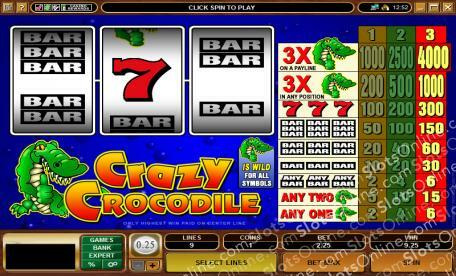 Crazy Crocodile symbols are wild, substituting for any other symbol and acting as the jackpot symbol.